The rumors were true: On Friday, Microsoft announced Windows 8.1 with Bing, a new version of Windows 8.1 available only to hardware manufacturers. The new edition of Windows appears to be the same as the standard version of Windows 8.1 (complete with this spring's Windows 8.1 Update), but with one major distinction: Windows 8.1 with Bing ships with Microsoft's search engine set as the default in Internet Explorer. That's no major change in and of itself, as Windows 8.1 already defaults to Internet Explorer and Bing. Hardware partners can change those settings on the devices they ship with normal versions of Windows, however. It seems that's verboten for PC makers who embrace Windows 8.1 with Bing. End users will be able to change that in the browser's settings, however—Microsoft's in no rush for another regulatory spanking, it seems. Beyond that, Microsoft notes that "Some of these devices, in particular tablets, will also come with Office or a one-year subscription to Office 365." Leaks about Windows 8.1 with Bing first sprang out in February, suggesting that the edition would be stuffed with Microsoft services in order to provide the operating system for cheap or possibly even free to hardware manufacturers. Documentation leaked shortly thereafter stated that "Windows 8.1 with Bing helps OEMs add Windows to low-cost devices while driving end user usage of Microsoft Services such as Bing and OneDrive." Indeed, Microsoft's announcement of the new edition of Windows is rife with commentary about reducing the hardware specifications for Windows 8.1 and quotes like "many of these lower cost devices will come with a new edition of Windows called Windows 8.1 with Bing." Taken together, that strongly suggests that Microsoft is providing Windows 8.1 with Bing to its hardware partners at a discount—no surprise considering the company's waging a price war with Google for the hearts and mind-share of the next generation of technology users. Microsoft already made Windows free for phones, small-screen tablets, and so-called "Internet of Things" devices under 8 inches at this year's Build conference. 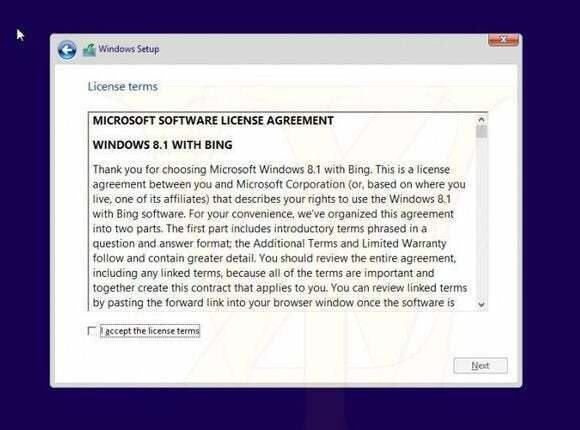 The verbiage in Microsoft's post suggests the free version of Windows 8.1 is actually Windows 8.1 with Bing. "The Windows 8.1 with Bing referenced on the Windows Blog is the edition that is licensed in connection with the recently announced royalty-free option for small tablets. Microsoft will license this edition for other OEM form factors as well. OEMs will each determine which types of devices they want to bring to market with this edition of Windows." But it's hard to imagine Microsoft just giving Windows 8.1 with Bing away for free in Chrome OS-like fashion to partners for devices with larger screens—the company's still playing from a position of strength in the PC market and needs to make its Windows money somehow. If Windows 8.1 with Bing is being provided even at a discount to hardware partners for devices with larger screens, however, we may start seeing more low-priced (and moderately performing) Windows machines to counter the Chromebook threat. Look for the first devices packing Windows 8.1 with Bing to be announced at Computex in early June.